>>> Warning : none of the following charges are to be paid by passengers. * Basis: Maximum permissible take-off weight in the C. of A. * LIGHTING CHARGES : Levied at aircraft landing at a controlled aerodrome outside normal hours one-fifth (1/5) of the single day landing charge. If a take-off occurs within seventy minutes of landing, no such charge will be levied. US$ 40 per departing passenger on an international flight. 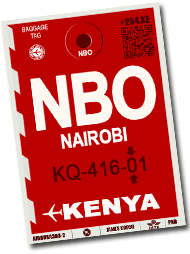 KSH 600 per departing passenger on a domestic flight.